Each story in MY FAVOURITE BIBLE STORYBOOK FOR EARLY READERS is written at just the right level for children who are beginning the adventure of reading. They will enjoy the accomplishment of reading the stories themselves and learn the truths of the Bible at the same time. Colourful illustrations fill each page, making this book a fun learning experience for young readers and non-readers alike. Features 90 Old and New Testament stories. Ages 4-9. 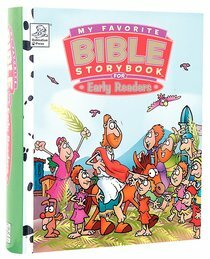 About "My Favorite Bible Storybook For Early Readers (My Favorite Bible Storybook Series)"
"I can read it all by myself!" The Old and New Testament stories are written at just the right level for children who are beginning the adventure of reading. Filled with colorful illustrations and 90 stories that teach valuable lessons. The greatest story ever told--adapted for young ones of all ages! My Favorite Bible Storybooks from Dalmatian Press are the gift parents and grandparents love to give. With faithfully-adapted Bible stories, full-color illustrations and added features, each Bible Storybook is designed to appeal to a specific age group, from birth to nine years old. Visual appeal and lasting value make My Favorite Bible Storybooks from Dalmatian Press a guaranteed sales success! Carolyn Larsen has written more than 30 books for children and adults. She is a frequent conference speaker around the world, bringing scriptural messages filled with humor and tenderness. She is also active in a theater troupe and co-founded the group Flashpoints, which uses drama and creative movement to minister at women's events.- Publisher. Grey is a professional photographer and photography lecturer.